What I really wanted yesterday was a swim to cool off from driving, but instead I swear I was going to be sucked under alive by quicksand. 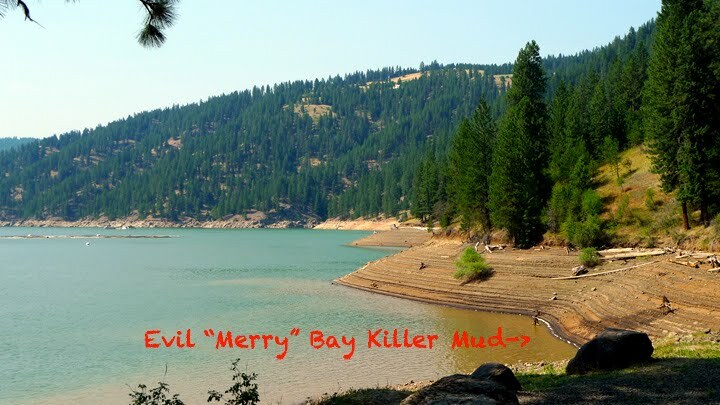 Alone yesterday at (Scary) Merry Bay near the town of Orofino, Idaho I found myself knee deep stuck in muck and wet sand. My first reaction was panic, if this stuff takes me under no one will ever find me! Ok, so a little dramatic but really I’m never going back there. 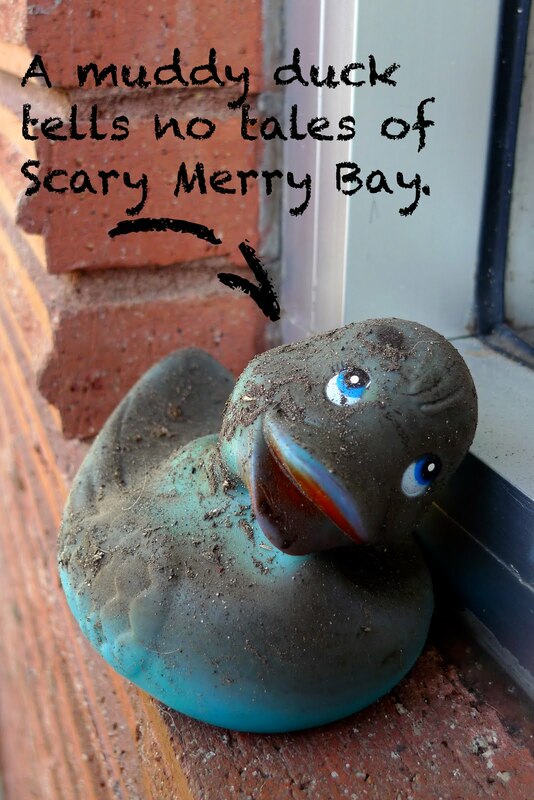 What kind of joke is it to name something so sinister, “Merry Bay”, anyway? I was lucky to get away with my shoes! I’d probably do something like that, but I’d at least put out a warning about man-eating sand. 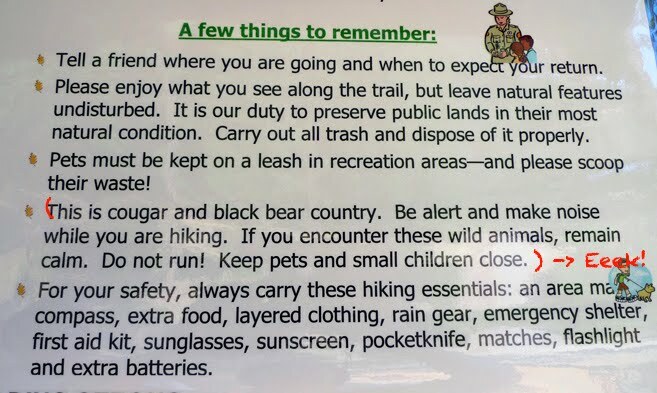 There’s a warning for cougars and black bears, but nothing for evil sinking mud. 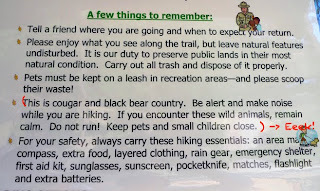 The sign informed me about great fishing, hiking (with scary wild animals), picnicking, and other recreational activities. I did notice beforehand swi mming wasn’t on the list. Maybe there’s the tip-off. I think I’ve developed a phobia of quick sand. I know many of you believe I’ve vanished. Though not the fault of the sand, I blame it on our Idaho summer. I’ve been outside playing or traveli ng and nowhere near a computer. This is necessary in order to store enough vitamin D in my system that I don’t lash out and kill my husband in the middle of winter when dark arrives everyday at 4p.m., providing an environment only hospitable for polar bears and snowboarders. So, if you sent emails or left messages please don’t take me for dead. I’ll write back as soon as I’m forced inside by the biting miserable cold. Or hopefully well before then. There wasn't a place to wash off and my feet are still died slightly yellow from the strange mud, but they're oh so soft now! I know, I'll set up a Merry Bay Spa Party and we can all get stuck in the name of beauty. Or not. As you probably guessed by now, I haven't been cooking much lately. For today I've pulled another recipe from the "Summer Grilling Guide". It's a rendition of my brother Steve's tasty rib recipe. When it comes to ribs low and slow with a blast of heat at the end gives tender fall off the bone meat with flavorful caramelized outsides. This can be done two ways, by slowly baking ribs in the oven and finishing on the grill, or grilling the entire time. The choice is yours. If still attached, remove the slivery membrane on the back of the ribs. Slide a paring knife under the skin and grab the membrane with a paper towel to remove it. 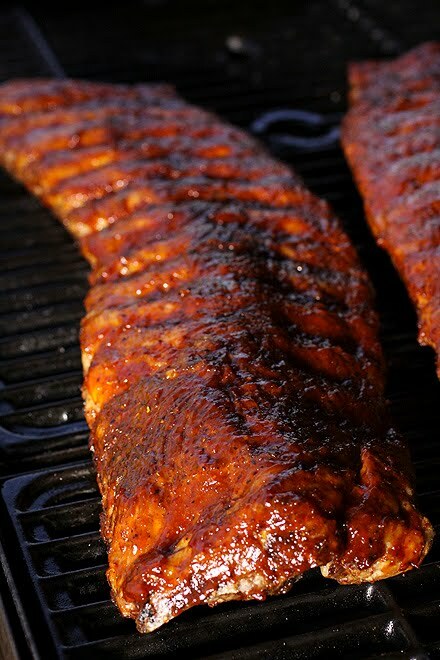 Place the ribs on large sheets of foil and rub each rack with 2 tablespoons vinegar. Generously sprinkle and rub with seasoning salt, paprika, and freshly cracked pepper. Cover completely with foil and place on a rimmed baking sheet. Oven method: Preheat to 300 degrees. Bake for 2 ½ hours. Remove from oven, unwrap and slice into servings for easier handling. Place on a hot grill and brush with rib sauce turning once. Baste with sauce and remove from heat when ribs are done. Grill method: Preheat grill to 300 degrees. Place the baking sheet with the ribs on the grill. Monitor the temperature. After 2 ½ hours remove pan from the grill, unwrap and slice into servings for easier handling. Turn the heat to high and place ribs directly on the grill. Brush with rib sauce. Turn once and baste the other side with sauce. Remove from heat when ribs looks done to taste. Heat oil in a saucepan. Add garlic and sauté until fragrant, about 30 seconds. Add the remaining ingredients and simmer on medium-low stirring frequently until thickened. Recipe & photographs by Laura Flowers. Recipe for Beckett Entertainment Plus Summer Grilling Guide, 2010.
will it ruin my screen if i lick that picture of the ribs? I was planning on making ribs this weekend. I am definitely going to make them after reading this post! They look great. These ribs look mighty tasty! Lol Sue I don't think they'd have post cards of Merry Bay. That's just a picture I wrote on. I am very excited about this recipe! I have been wanting to make ribs and now you've given me one more reason to. Thanks! I wouldn't want to be anywhere near quicksand either. Laura, enjoy your time in the sun and away from the computer. I cannot wait until I do the same. Anyway, these ribs look so tantalizing. They are calling my name! I have an extreme fear of quick sand too...must be from watching the Princess Bride so much growing up. I'm glad you have been spending so much time outdoors...being active during these warm months is good for the soul! Summer is a great time, isn't it? Love your ribs. I have some men that would eat these in two minutes flat. Merry Bay looks lovely, despite the dangers untold! Oh my goodness, I know all too well about sinking mud. Once we were building a home in the Spring time. The rain had been relentless for days and days. The grass had not yet been installed, so the yard was nothing but a mucky muddy mess. As I stopped by the house to check on the progress of the construction, and walked the same dirt path many times before. Suddenly, my right foot started sinking - deeper and deeper and deeper. The more I tried to pull my leg out of the hole, the deeper my other foot started to sink. By the time my right leg was buried to about mid-thigh, I finally figured out that I needed to kind of lay on the mud to keep from sinking any deeper. Eventually a couple of the construction guys were able to pull me out, but my sock and shoe were never seen again. That incident is what nightmares are made of!! Oops, forgot to comment on your yummy ribs. I love to make them in the oven, low and slow. Fabulous! Love the sauce it sounds so delicious and I'll bet it's fantastic. Enjoy your summer Laura, winter will be here all too soon! That is one huge, juicy looking slab of ribs. Yum, can't get better than ribs falling off the bone. I am loving that rib sauce. YUMM. Glad you are safe from the evil mudd! Those ribs look very good. Mind if i reach thru and grab a bite?? Seriously, i am going to try this sauce, it sounds and looks awesome.